(We are open until 20:00 on Fridays and Saturdays. 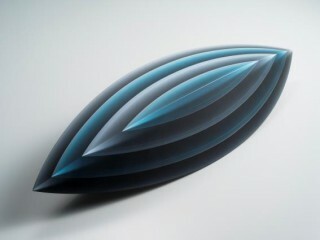 The current exhibition focuses on ten artists who submitted work to “Contemporary Glass Triennial in Toyama,” were selected and received awards, and who have since furthered their creative practices and expanded their activities: TSUKADA Midori, NIIMI Hiroki, NISHI Etsuko, OMURA Shunji, ODAHASHI Masayo, OKUNO Mica, OHGITA Katsuya, HONGO Jin, KOSOGAWA Runa, and KOJIMA Yukako. These artists first encountered glass through their interest in other wide-ranging fields, such as metal casting, ceramics, painting, and architecture. They have since continually explored the potential for artistic expression in the glass medium. 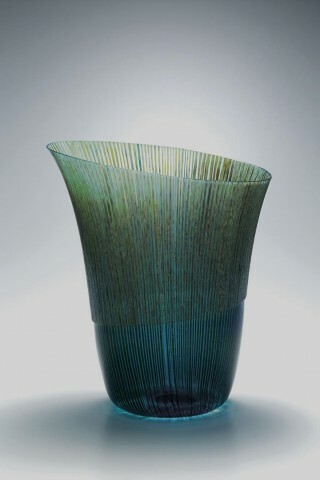 While mastering glassblowing, cold working, lamination, and other specialized glass techniques, they have experimented during production and sought out expressive possibilities. Always, it is the mysterious beauty of the glass that awakens their creative impulses—the qualities glimpsed the instant the glass melts and glows under high heat, for example, or the beauty of the light captured inside the cooled, hardened glass or reflecting diffusely from its surface, or the way the glass transforms like rock or water under grinding. Inspired by the visual qualities of the glass, in this way, the artists embody their themes, whether nature, their own spirit, memory, or human undertakings, in artworks that are distinctive and unique. “Feeling in glass” shows how the artists take opportunity from what they sense and feel during production to pioneer their own expressive methods and artwork world. By examining their perspectives and creative stance as artists who continually produce new forms from a dialogue with glass, the exhibition attempts to cast light on each artist’s ongoing journey of discovery. The price in the ( ) is the price for groups. Those in groups are to be 20 or more. With this exhibition ticket, you can view both the Collection Exhibition and the Glass Art Garden.